Gray skies are going to clear up, put on a happy face… because somewhere over the rainbow, bluebirds fly! I do put on a happy face whenever I witness the splendor of a Rainbow! 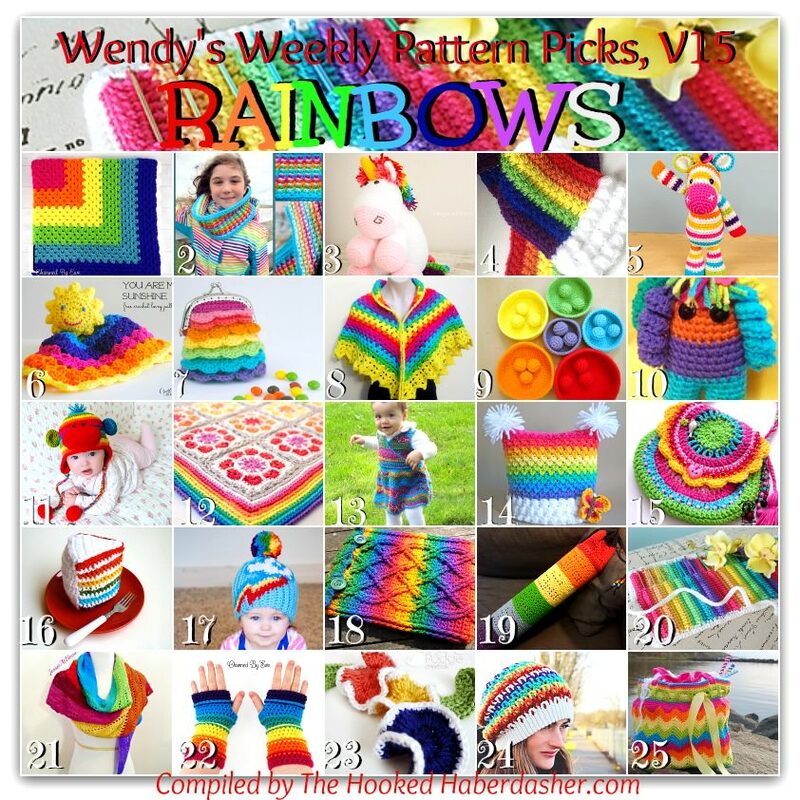 This edition of Wendy’s Weekly Pattern Picks, is all about crochet patterns representing the RAINBOW! I’ve hunted down twenty-five free and paid crochet patterns that lead you to the Pot of Gold! Beginner and can’t self teach myself from just the written instruction. My biggest difficulty is ready the written instruction for all stitches and turning pattern around to the next new row. Some rows come good and some come looking like I missed a stitch. I’m getting frustrated.any suggestions for a beginner???? A new hobby for my enjoyment. Thanks Jackie! I’m so glad you are learning crochet! It is a wonderful hobby. I actually have a post about bobble stitches http://www.thecrochetcafe.com/popcorn-and-bobble-stitches/ There are some tutorials and then some projects with which you can practice bobbles. Feel free to ask questions anytime and I would also like to refer you to Happilyhooked.com. They have a wonderful magazine with great patterns for beginners and intermediate crocheters and lots of additional resources for crocheters.Good luck!